Died: Monday 7 June 1915, aged 31. How died: Died of wounds. 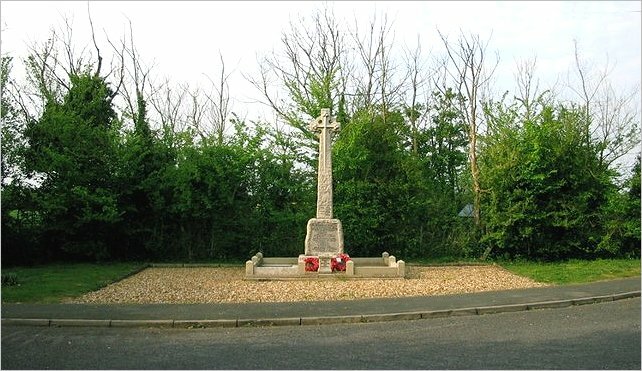 Although our War Memorial lists Charles as C Pratt, many of the available military records give his enlisted name as either Charles Pratt Hales (CWGC) or Charles Hales Pratt (2nd Battalion Rifle Brigade), Hales being his mother's maiden name. "Lance-Corporal Hales Pratt of the 2nd Battalion Rifle Brigade, a son of Mr and Mrs C Pratt of Wimpole, died from his wounds in hospital, at Rouen, on June 7th 1915. 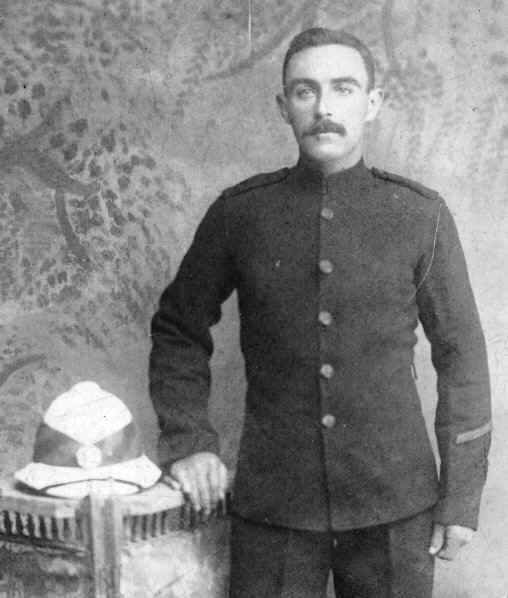 Lance-Corporal Hales Pratt (who was 31 years of age) was serving in India when War broke out. He came home for 48 hours, and then went straight out to the Front. In January 1915, he was sent home with frost-bitten feet, but returned again to duty on the 28th. He was seriously wounded in the fighting near Neuve Chapelle, and after a month's suffering died on June 7th." 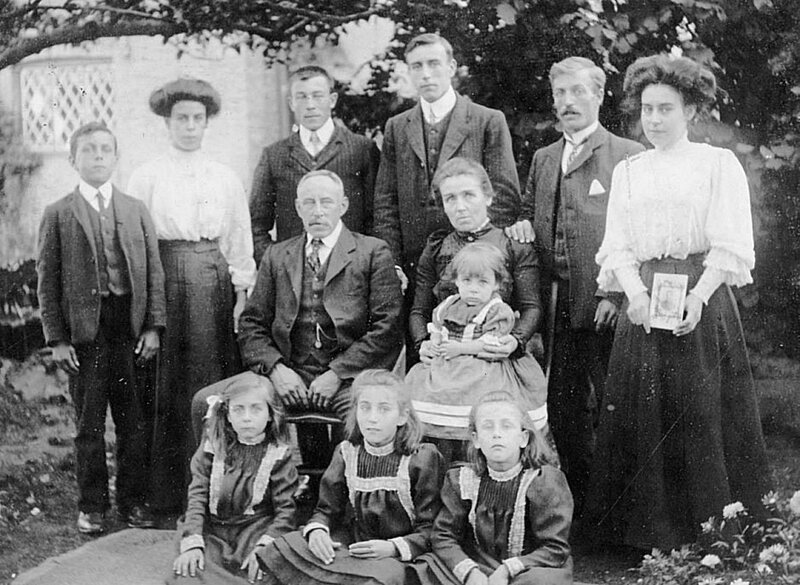 Back Row (standing) left to right: Richard Pratt (b 1896), Charlotte Pratt (b 1894), David Pratt (b 1888), James Pratt (b 1891), William Ingrey Hales (b 1882), Annie Pratt (b 1890) holding photograph of Charles Hales Pratt (1884-1915) who was away on military service. Front Row (seated) left to right: Lydia Mary Pratt (b 1903), Nellie Pratt (b 1898), Elizabeth Pratt (b 1900). 14 October 2007. Chris Goodfellow writes "The 2nd Battalion Rifle Brigade records show that Charles Hales Pratt first arrived in France on 7 November 1914. He was entitled to the 1914 Star (with clasp and rose), showing service with the British Expeditionary Force prior to 31 December 1914, the British War Medal and Victory Medal. The clasp and rose for service under fire was never claimed by the family." Cemetery: St Sever Cemetery, Rouen, Seine-Maritime, France. St Sever Cemetery and St Sever Cemetery Extension are located within a large communal cemetery situated on the south of Rouen. Almost all of the hospitals at Rouen remained there for practically the whole of the war. 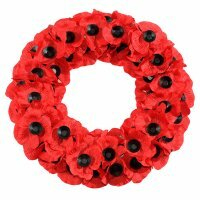 They included eight general, five stationary, one British Red Cross, one labour hospital, and No. 2 Convalescent Depot. A number of the dead from these hospitals were buried in other cemeteries, but the great majority were taken to the city cemetery of St. Sever. St. 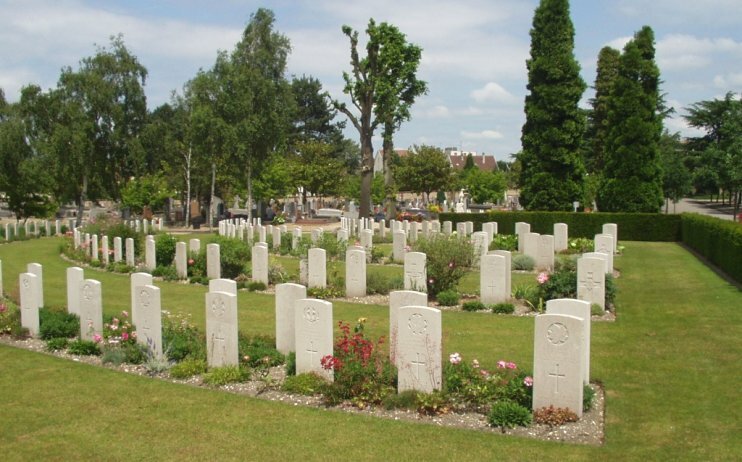 Sever Cemetery contains 3,082 wartime burials of British and Commonwealth troops. Charles Pratt Hales for this page.